"Time Gentlemen, Please! is a point-and-click adventure game developed by Zombie Cow Studios. It is the sequel to the freeware game Ben There, Dan That! and was commercially released on June 22, 2009. As with the first game, Time Gentlemen, Please! was created using the Adventure Game Studio engine." 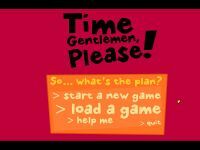 Source: Wikipedia, "Time_Gentlemen,_Please!_(video_game)," available under the CC-BY-SA License.